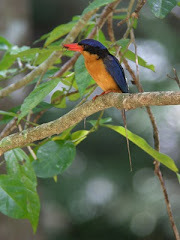 Red Mill House - Daintree Birdwatching: Spring is in the air! After two weeks of very windy, and often wet, conditions we have beautiful sunshine and warm clear days to 30 degrees. You can hear new signs of spring every day at the moment - cuckoos lead the way. Brush Cuckoo has been calling incessantly every morning for a couple of weeks now, Australasian Koel also calling for the last week and now Channel-billed Cuckoo, our 'storm season' indicator has also arrived. Other summer migrants recent arrived include Pied Imperial Pigeons feeding on rainforest fruits, Metallic Starlings madly building their communal nests and Brown-backed Honeyeater noisily building nests and feeding in the paperbarks. Other wonderful birds at present in the garden at Red Mill House include monarchs - Black-faced Monarch, Spectacled Monarch and our endemic Pied Monarch. Satin and Leaden Flycatcher complete the flycatcher types enjoying the plentiful insects after some reasonable rain in the last couple of weeks.It is a fabulous time of year in the Daintree as new growth abounds on rainforest trees and the figs are fruiting. 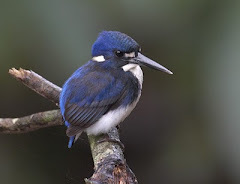 Other sightings on the Daintree River include Lathams Snipe, Papuan Frogmouth, Australian Reed-Warbler and Great-billed Heron preparing for nesting. The local roads in the Daintree Valley have been very productive also - all the herons, Black-necked Stork, Black-fronted Dotterel, Australian Pipit, Royal Spoonbill, Glossy Ibis and many more. Red-backed Fairy Wrens have been seen carrying nesting material. A favourite for everyone is the flocks of Chestnut-breasted Mannikins feeding on the seed heads of grasses in the fields. Such fun to watch!